Bac Ha market in Lao Cai province is held every Sunday morning and offers a wide range of products, including clothes, farm tools, and housewares. It is a trading center for ethnic minority people in Bac Ha district and neighboring areas. At the break of dawn, the market begins to hum with conversations and laughter. As the sun rises higher, the whole market is adorned with the colorful costumes of Mong women. It is not just a trading place but also a meeting place where young men and women find their partners. For them, the market is a like a festival, so they wear their most beautiful clothes when they go to the market. During the first days of the Lunar New Year, the most sought after items are kitchen utensils and agricultural tools. Vang Van Lo of the Tay ethnic group in Na Hoi wants to buy a plough. “This plough is US$15. It’s expensive but I like it. I want to buy a new plough for a good harvest in the New Year,” he said. Bac Ha is famous for its horse racing. Equestrian gear attracts a crowd of customers. There are saddles, bridles, and horseshoes. To Cui of the Phu La ethnic group in Na Hoi commune said both women and men in Phu La are very good at making saddles. He came to the market with four saddles that he made himself. “A saddle costs US$7. I can make 4 saddles a week. I hope to sell them all today. In July and August, we sell tens of saddles a day. They are all made of wood,” he said. Bac Ha market is divided into different sections offering different types of goods like brocade weaving products, food, horses, buffalos, poultry, birds, and wine. Each section has its own atmosphere and sounds. The section that sells buffaloes, oxen, and horses is the most crowded place in the market. Local brocade weaving products hand-made by local women are greatly desired by customers. Colorful clothes are displayed with silver and brass accessories like bracelets and rings. 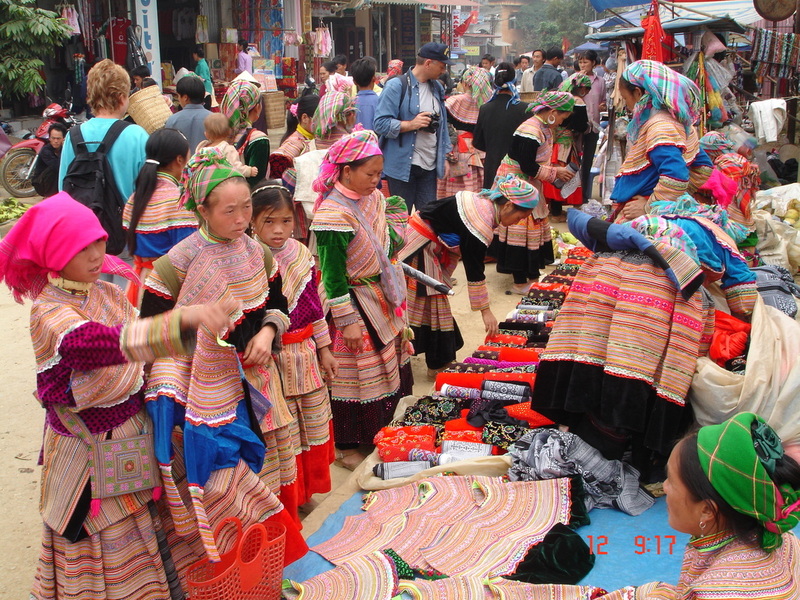 Local people in Lao Cai don’t go to Bac Ha market just to shop. It’s also an opportunity for them to leave their mountain and enjoy local specialties like corn alcohol, ‘the men men’ or steamed corn flour, and ‘thang co’ or soup made of spiced horse entrails. It’s also a place to meet friends. Authentic, original and charming- Bac Ha market is really worth a visit.